As mentioned in Part One of this blog where we discussed the reasons behind the switch from Premiere to FCPX (and PC to Apple), as a video production company our choice of editing software is paramount and after eight years of using Adobe Premiere Pro as our preferred NLE system last year we decided to make the transition to Apple’s Final Cut Pro X. While making the decision we spent a lot of time browsing online and discussing in forums whether to make the change or not. 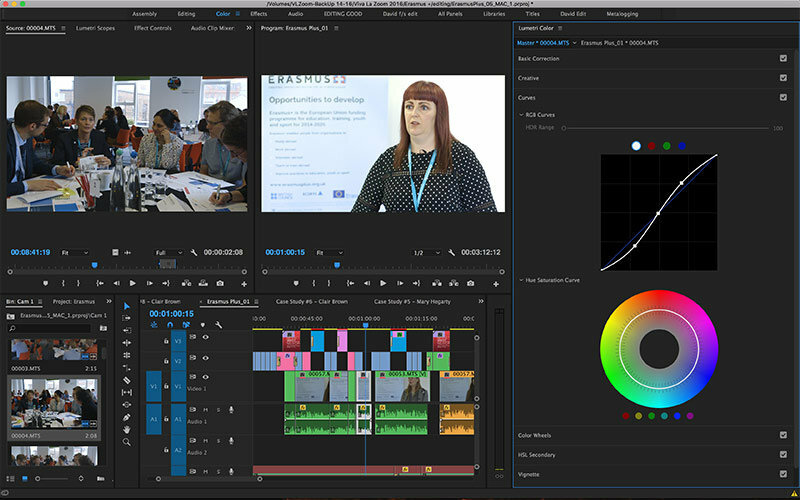 Six months on from making it we now feel like it is time to give back and have produced a little online article of what we think are some of the pros and cons of both Adobe Premiere Pro and Apple’s Final Cut Pro X. So if you’re thinking of making the change, or already have done in one direction or the other, we hope that you enjoy reading, and please do leave a comment if you agree or disagree with anything that we’ve found! The Creative Cloud: The concept of Creative Cloud is very appealing: being able to use all of Adobe’s professional softwares including Photoshop, Illustrator, After Effects and of course Premiere Pro is an interesting prospect and encourages you to learn new skills as if you’re paying for the software you may as well use them, right? Dynamic Link: Similarly to above, the ability to use different software is great, but the ability to seamlessly import and export between software without the need to render files and without losing things like layers is incredibly useful. Dynamic link is great but…does it always work? and how fast is it? It’s a Traditional NLE: This could be an advantage or disadvantage depending how you look at it, but the fact is the taken on its own Premiere Pro is a traditional NLE. If you’ve used AVID, Sony Vegas or even Final Cut Pro 7 in the past then you’ll find Premiere Pro very easy to pick up. It has tracks, bins and all the cut and trim tools you’d expect in a NLE. Good colour correction and audio controls: For colour correction there are a lot of built in options in Premiere Pro, and since they introduced Lumetri you can now do quite powerful colour corrections really quite quickly. While the audio filters in Premiere aren’t as good or powerful as the colour correction ones (we tend to switch to Audition for most audio fixes), for balancing and mixing audio levels the built-in tools are really quite good. Cross-compatible, use on a PC or MAC: Whether you’ve got an old bust-up PC laptop or the latest MacPro you’ll probably be able to run a version of Premiere Pro. It works on PC or Mac so you don’t need to invest in new equipment to give it a try. Looking back at this list it does seem like Premiere Pro is a pretty good piece of software to edit videos with, and that’s because in theory it is. And this was the key thing for us: we found that for all the great features that Premiere Pro offered there seemed to always be ‘bugs’ in the system. Put simply: things that should work didn’t work, or the software had random behaviour which affected our workflow. These bugs at first seemed little things which on their own seemed minimal, yet when they reoccured over and over, even after major updates to the software, they became major problems to us that affected both our efficiency and enjoyment in using the software. At first we thought maybe we had a hardware issue, but we soon found that many others were experiencing the same problems as us. Among the bugs and problems that we regularly experienced, there were a few that particularly stood out and seemed to remain unfixed for many months, even years in some cases. Non-stop playhead in Multicam Timelines: When editing or playing a Multicamera timeline the playhead would play continuously and not react to any buttons pressed by the user. This could last seconds, minutes or the entire length of your timeline. Nearly always it resulted in force closing Premiere and starting again. It usually happened again straight after. Xmas tree effect on the bins: This bug used to drive me mad. Sometimes we you open Premiere, the thumbnails in any particular bin would seem to regenerate themselves constantly creating what someone online called ‘The Xmas tree effect’. You would have to close and re-open in order to get rid of the bug. Right click appears on different screen: We often edit on two screens and found that if we right clicked on something on our second screen then the drop-down list would actually appear on the other screen. This would mean jumping the cursor from screen to screen constantly. 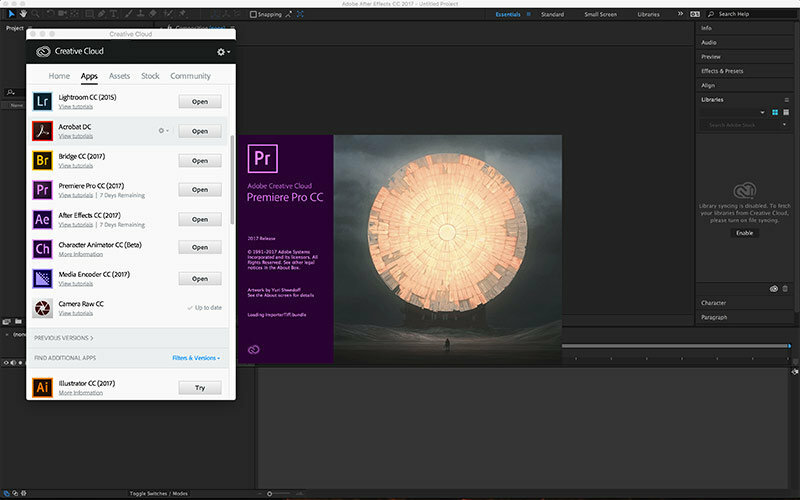 Dynamic Link – good concept, poor execution: Yes, this made the pros list for Premiere Pro because when it works it is a great tool, yet we often found that it just didn’t work as well as it should. We often found that if for example we updated a project in After Effects it wouldn’t update in Premiere Pro, or it would update there but upon rendering it would actually render out an old version. This last example was particularly annoying for it created the problem of the rendered video not matching your timeline, so despite checking your timeline for errors, you would have to check every video render too. Render Fails – The famous sheep’s baa: Ah, that sound can trigger editor’s anger like no other. We don’t mind renders failing, in fact we know it will probably always happen in any software, but what was most annoying was reading the why the render failed and just being told ‘Unknown Error’. If you had a large timeline this often meant tracking through and trying to guess why the render was failing. Often we found it was effects on clips which caused this, but it would’ve been nice for Premiere to give us a bit more help as to why and where the render failed in a timeline. Cost – You rent it, you don’t own it: Simple maths really: FCPX, Motion and Compressor cost less than £300 and you own them forever, whereas Adobe Creative Cloud is subscription based which means for £300 we would only be able to use Creative Cloud for seven months before we start paying more for it in comparison. Yes, Creative Cloud has lots more software included for that price, and if you use all of the software included then it can be a real bargain. However; for a video production company like us we’ve found that FCPX, Motion and Compressor can do everything we need and more. As we’ve said these points may seen minor, or very specific, but after years of using the software and minor bugs affecting our workflow everyday we started to look around for alternatives, especially in the hope of finding a more ‘stable’ editing system: one without bugs and one that just worked smoothly. This time also coincided with us upgrading our computers from old PC workstations to Apple iMacs (see Part One of our blog LINK), so now we were able to use FCPX if we chose to do so. Which we did. 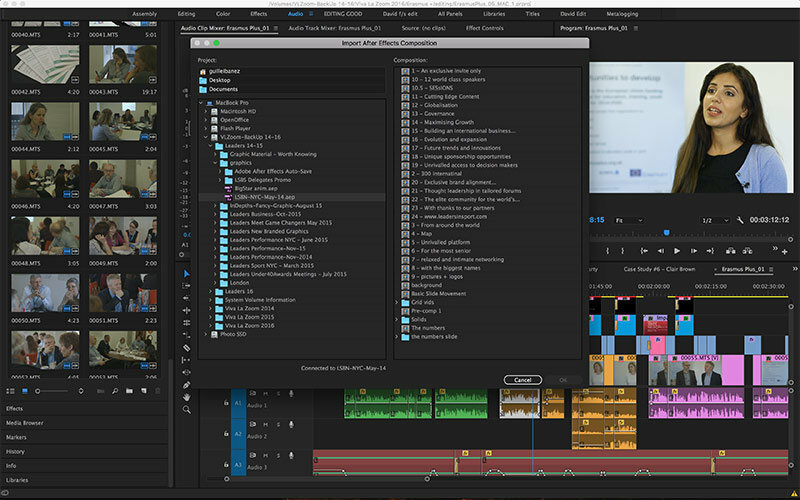 FCPX has recently seen a big interface overhaul…well needed I’d say! Judging by online comments the second point above has tended to be a bit of a deal-breaker with a lot of people trying FCPX; some people tend to love the magnetic timeline approach and some seem to hate it. To be honest we love it. It takes a little getting used to but it can make editing much more quicker and intuitive, and almost feels like a notepad: you can put things wherever you want, there are no real restrictions. No ‘save’ function, instead a constant autosave: At first it felt a bit strange not being able to save your work yourself, but soon you seem to realise that this function actually works incredibly well. If for example your computer crashes gone are the times you’d lose your work since the last autosave, instead you just reopen your FCPX library and voila there’s your timeline exactly as it was before the crash! We love this feature, we trust it to work and it has never let us down. Very responsive: We started using FCPX at the same time as buying new a iMac for our studio and we found that the speed and reliability of using FCPX on a new iMac was unbelievable. No lags, no jitters, everything just worked smoothy and quickly. Premiere Pro on the new iMac, as outlined above, we found to be quite unreliable. Open more than one project (or Library) at the same time: This simple sounding feature actually really helps on a day-to-day level when working on different projects. It means if we’re working on one client’s project and we need to quickly look at another client’s project we don’t have to close our project and re-open another, instead we can open multiple projects at once. It’s perhaps even more useful in that we can open several projects and share footage between them, which is particularly useful if you have a regular client you work with and you want to reuse older footage – no more re-importing. Keyword folders much better than Adobe bins for organising: This is a simple, but real winning feature. The keyword folders are so much better for organising footage that we’re sure that other NLEs will end up copying it eventually. It allows you to organise your clips and sequences with keywords (this could be for example ‘interview’, ‘gv’, ‘dolly’ etc.) and any clip can have as many keywords as you want. This feature might seem obvious and unexciting in print, but once you start organising your footage this way we found that we can edit quicker and better by having our footage nicely organised. Cost – You own it, you don’t rent it: As mentioned on the cons for Premiere Pro, with FCPX you actually own the software outright. If money is a consideration for you, and you only want video editing software, then FCPX is a real bargain. Although no system is perfect, on the whole what we value most about FCPX is its reliability. It works. No half-baked flashy features, if a feature is there, it’ll do what it says on the tin. You can really tell that every update has been checked thoroughly. That is not to say that there aren’t some things that we don’t like about FCPX. Like any software we’ve used there are some small gripes that we have with FCPX. Workaround: So, taking into account some of the comments on the article we would agree that we overlooked the ‘roles’ and ‘lanes’ feature here. The lanes feature especially if you’re used to a more traditional NLE system like Premiere Pro will feel more familiar. It basically works by giving your footage roles according to content (e.g. labelling footage ‘Interviews’, ‘GVs’ or whatever you want for your given project) and then you can select to view your project with the lanes visible. This allows much more control over audio editing than we outlined initially above. If you want to see a really great video which outlines a good workflow in FCPX then this video by Soho Editors/Trim Editing Thomas Grove-Carter goes though lots of cool stuff (in particular the audio editing at 20:30-26:00 and 34:30-36:00). Colour Correction: The most striking thing about the built in colour corrector in FCPX is that it has no curves. The FCPX tool is not bad, but we’ve found it a little hard to really control the colour and exposure in an image with it beyond doing the basics. Workaround: we often use third-party plugins and bypass the built-in FCPX colour control completely. A couple of plugins that we use are Color Finale and FilmConvert, which are both well worth looking into. Also, for a slightly longer workaround Blackmagic DaVinci Resolve is a free download but is a great tool for colour grading and also for basic editing. Workaround: it seems that the ‘Trim’ tool (shortcut T) is the most popular tool to use for most edits in FCPX and is a good starting tool for doing most edits in FCPX. Also, holding down a tool shortcut while doing an edit and then releasing the button after is a good way to temporarily use a tool. Transitions: Again due to the way the magic timeline works transitions never start where you’d expect them to start; for example if you have your playhead at the point where you’d want your transition to start and add a transition, your cursor actually marks the midpoint of the transition, not the start. We find this quite annoying and wish we could change this. Workaround: if you want a clip to fade in from black at the exact place your playhead is then a quick way is to lift the clip from the timeline (Option-Command-Up Arrow), add the transition (cmd-T) and then add back to timeline (Option-Command-Down Arrow). Or, just add the transition (cmd-T) and adjust manually :). The hold function: We probably get irrationally irritated by this feature more than any other. When working with footage or graphics we often want to hold a clip for a few seconds, maybe to add text or an effect on it. We literally just want it to hold for say five seconds and then the clip ends. Instead FCPX seems to always extend the clip, so it holds for a few seconds but then starts playing again. As it always extends the clip this can end up nudging other footage out of sync. We wish it wouldn’t do this. Workaround: add freeze frame (shortcut opt-f) can be used to add a traditional freeze frame instead of the hold function (which is more useful for speed ramping footage etc). The freeze frame still extends the clip but this can easily be edited after without affecting your project. We used used Adobe Creative Cloud for many years and when everything worked correctly it was, and is, an incredible piece of software for editing video. You can do anything with Premiere Pro that you’d want to do. If you’re using Premiere Pro now and you haven’t experienced any of the bugs we’ve listed above, and everything works great for you then, cost ignored, there is probably no need to change. But, when the cost is factored in we found that paying over £500 a year to rent the software and to then experience bugs on various different computers and hardware setups that never seemed to get fixed despite major updates, then we felt pushed to try something new. 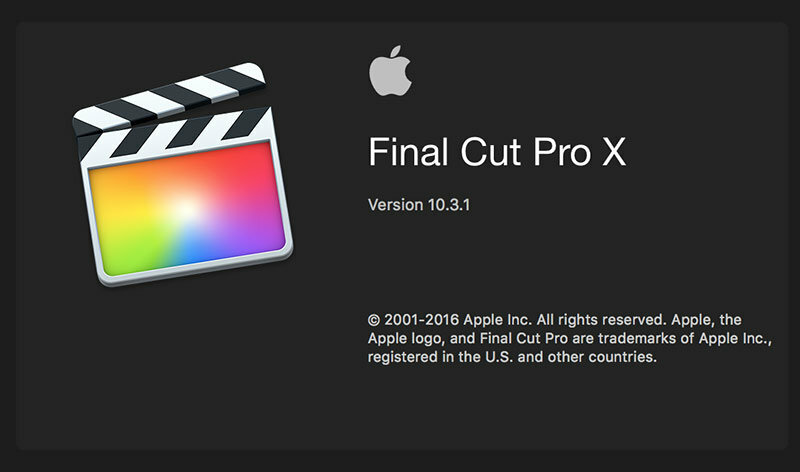 Final Cut Pro X was that something new, and despite having some minor flaws also we trust the software to to what it says it will do and we feel that it helps us to edit more efficiently. So for now, if all stays equal, we’re happy with our switch and can see no reason to look elsewhere for video editing software. Thank you for sharing your thoughts in this very thorough write up! I have a feeling once you get more comfortable in FCPX you’ll hardly use the position or blade tools again. They are useful, but there are a lot of other keyboard shortcuts to speed up editing in FCPX. One of my favorite tools is T for trim. Anyway, there are pros and cons to all software for sure, it’s just hard to ignore the speed and stability of FCPX. Hey Brad, glad you liked the article and thanks for commenting! Yes, we’re only 5-6 months down the line and we’re constantly changing how we work in FCPX (in a good way). And you’re right, it’s the speed and stability of FCPX that we’ve found to be its biggest asset for us personally. same her – i used “p” and “b” more often after transitioning from premiere, but haven’t used them for quite some time now. there are a lot of things that premiere does better (keyframing, reconnecting footage, …) but as annoying as it might sometimes be to muck around with compound clips in fcpx or to have no control over one’s keyframes (or having to build an effect in motion just to have any) – the editing speed in fcpx is unparalleled and makes up for a lot. Hey Mischa, yes it’s funny how the shortcuts I use tend to change the more I use the software. I also find reconnecting footage a bit better in Premiere; it can be quite frustrating replacing footage in FCPX as it seems to have more restrictions on what can be a replacement. Re: keyframes I find being able to open the keyframes on a clip in FCPX with control-v is useful, but I agree they tend to be easier to control in PPro. But yes, the speed, efficiency and reliability of FCPX make it a great piece of software. 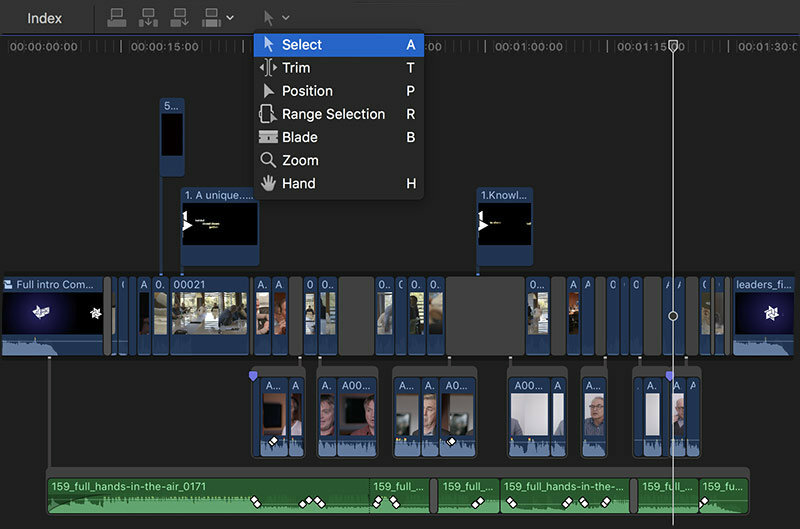 Im surprised you did not mention the “roles”, another unique feature of FCPX that allows to magically organise the timeline into lanes and also provide a fantastic audio mixing tool. The role feature has been immenselly updated in the latest 10.3 version though. Hey, good comment. I think you’re right actually: we probably did overlook ‘roles’ a bit here. I’ve been using it more and more recently and it does make audio editing much better. I guess it’s another example of us having to think outside the Premiere, or any traditional NLE, mindset. Thank you for this in depth article. Over here on the Mac side for many years, we are getting a lot of criticism from those who claim the Mac is dying or using outdated technology but still sold as Apple’s latest thing. When you have acces to the latest and most powerful CPUs and GPUs ( custom building your own Windows PC’s ) do Adobe’s Creative Cloud applications run much faster or overall better than on your iMacs? This is one reason why I consider moving in — the opposite direction — to custom Windows based pc’s because I imagine with all that power, Adobe applications would be much better. How true is this? The one thing you have to remember is that Premiere Pro can’t be optimised for any one system as it runs on both Macs and PCs and there’s so many configurations of PCs out there. FCPX on the other hand is programmed by the same company that builds the only hardware and configurations of such that it runs on so they can and have juiced every once of power out of their systems. I saw a video that went into this in some detail a few months ago running tests with PP vs FCPX on edit and refer times. PP on a very beefed up tower PC and FCPX on a standard MacBook Pro. FCPX won on every test. Partly because of the fact it’s faster to edit with (on average 3 – 5 clicks after per function) and partly because the software is optimised for the exact machine it’s running on so all rendering etc was also faster. I agree Apple is lagging behind for various reasons but when you look at the package as a whole it’s still better to stick to a closed ecosystem like Macs and FCPX in my opinion. Especially with the 10.3 upgrade. There are endless videos proving the exact opposite! Try these maybe?? Nuff said. PPro is an unbearable SLOTH, plagued by age old code! Hey Mark, thanks for your comment. I actually agree with the comments from Pieter van Es and Andie Moepse here: there are plenty of ‘objective’ tests online that show FCPX performs very well on a Mac compared to PPro on a maxed out PC, but also from a purely personal and subjective point of view we’ve found that when we used PPro on a maxed out PC it still didn’t run as well as FCPX on a new iMac. That’s purely subjective from our point of view, but it’s also from a ‘real world’ situation too, which is most important to us. I agree with Pieter van Es’s comment that ‘FCPX…is programmed by the same company that builds the only hardware and configurations of such that it runs on so they can and have juiced every once of power out of their systems’. FCPX only has a handful of computer models that it can work on and perhaps that is why it runs better in the real world than it’s specs suggest it would on paper. This article inspired me to comment because of your real-world usage on both platforms. I still use Adobe CC applications for certain projects. It is hard to believe that a company like Adobe who sells their products for multiple times the amount of other very good tools which often perform better, cannot smooth their performance issues. I started to believe it was only a Mac issue. Cue the grass-is-always-greener scenario. I will not be leaving the Mac anytime soon, unless something drastically happens to the platform for the worse — which in itself is hard to imagine. It is good to see long-term results posted rather than tech articles primarily written for click-bait that only look at specs and/or proclaim one platform is dying over another. Thank you very much for these two articles. I’m at a rather basic level when it comes to video editing but it is nice to have some confirmation of the move from Premiere to Final Cut Pro that I made awhile back. FCPX just seemed so much easier and “cleaner” to me when I started but lately I’ve had the “grass is greener” syndrome so this is nice to see. Coming from a still photo editing background I really miss having curves for colour correction and I need to either get more comfortable with the FCPX way or try a separate app for this. Can you recommend one? Hey Rick, thanks for the comment. Yes, I agree, FCPX does seem easier and cleaner, which has a big effect on the enjoyment of using it I find. Re: color tools – Pieter van Es’s suggestion of Color Finale is a good suggestion, but also if you want to just test something, out Blackmagic Design’s have a basic version of Da Vinci for free download (https://www.blackmagicdesign.com/uk/products/davinciresolve/color), and even the free version I find to be a really good tool and works great with FCPX. Also, as you come from a photo background, I’d also suggest having a look at FilmConvert’s plugin (https://www.filmconvert.com/purchase); here you can add a ‘film look’ of lots of different film stocks – it’s great if you want to add some grain to an image; used sparingly I think this is a really great plug-in. It has a free trial version, so maybe give that a go first. There are probably lots of other good ones too, but they are what I’d suggest looking into first. Let us know too if you find one you really like! I’m a twenty two year Avid Media Composer guy who took up FCPX last year and besides a few things I really like Final Cut. Multi-cam mode is much simpler to use. Plug-ins are awesome. But I still prefer cutting extensive dialog in Media Composer. 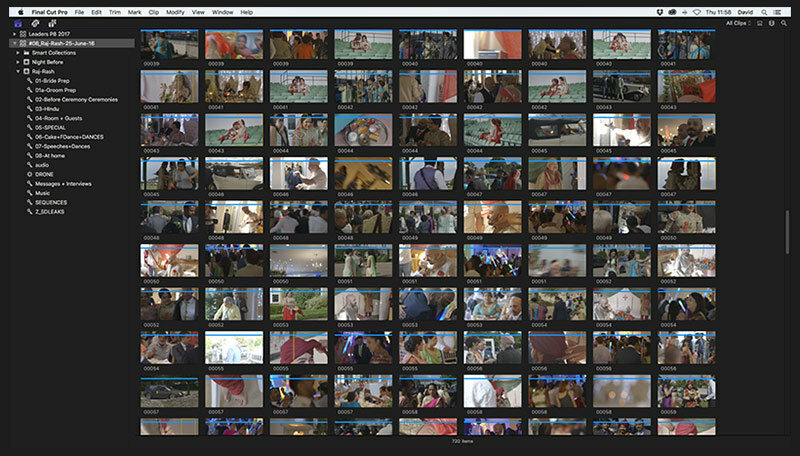 Organization in Final Cut is off the charts in ease and functionality. The best audio work is always achieved in an outboard app as well as theatrical level color grading. Best to use good calibrated monitors for all that sweetening. Wish list for FCPX is not too long but I have several. Hopefully Apple will realize the need for various crafty functions that make editing more quick and precise. I’m curious why you state that you prefer extensive dialogue editing in AVID? I’m actually the total opposite. I never enjoyed editing audio and specifically dialogue more than since using FCPx. Main reason is the precision due to sample accurate editing at all times. OH HELL YES. It is positively infuriating that Adobe continually focuses on cramming in new edge-case features, but seems uniterested in cleaning out the BUGS. I’d be quite happy if they skipped new features for a few maintenance releases where they just FIX THE BROKEN S**T.
Ha, yes Kurt, we agree with you here! We got to the point that whenever we got an email announcing a new major upgrade to CC we’d just role our eyes and laugh: they’d be big press releases of all the amazing new tools, but we’d know full we’ll that they wouldn’t have fixed the old problems. We got fed up with all the new announcements , we just wanted the software to work properly! It would appear to me, as if you still have not gone to the trouble of actually *learning* Final Cut Pro X. Most evident by your “switching a lot” to the POSITION tool of all things. Sorry, but you’re using the position tool often, then you simply still haven’t gotten it. Because if you’ve actually understood FCP X, then you would near NEVER need the position tool. Never mind that you don’t have to SWITCH, you can just press and HOLD the respective shortcut (e.g. B), use it, let go and it switches back automatically. One step saved already. Try ⌥W sometime and T. The position tool is the “I don’t get it” tool. Same goes for your #1 “con”. Hard to believe you write that AFTER the 10.3 update. Have you heard of “sub-roles” and maybe “compound clips”?? “Con” #4 is just bizarre. No idea what that even means. “Con” #5… seriously? You’ve never learned the software even well enough to have heard of FREEZE FRAMES? Hold frames only make any sense in very very few instances e.g. for speed ramps. Other than that, virtually useless. Otherwise you list most of the clear and huge advantages that Final Cut Pro X has over PPro. Or any other NLE imho. And again, actually *learn* the ins and outs and you’ll love it that much more. Hey Andie, thanks for reading and commenting. I also agree with some of your points, especially the ‘roles’ comment: we did overlook this feature and maybe we’ll update the article to take this into account. As I replied to a previous comment, I think that as we came to FCPX with a ‘PPro editors head’ on I think it took us a while to fully utilise the roles feature. But as this was just our subjective musings on what we found between FCPX and PPro in the few moths that we’ve used it, we may well have overlooked some features that others use more regularly, so thanks for pointing out that out to us. Also, I understand that you can hold the button on the keyboard and not completely switch tools, but my main point was that I didn’t want to be pressing the keyboard as much at all. But I agree that the T tool is the more powerful and I do use that a lot more. Re: freeze frames, I may be wrong but that still has the same problem for me: it adds length to the clip. Do you know a way to add a freeze frame without changing the length of the clip? I know in preferences it is the same duration as a still image import, but what I was trying to say was that I wanted to freeze the clip from where my playhead was and not add length? I’m a little confused by what you mean regarding wanting to freeze a frame without adding length. You would like it to replace the remainder of the clip with the freeze frame? I’m not aware of a single operation to do that, but my approach when I’m doing an edit where I want to preserve timing is to ‘lift’ the clip from the primary timeline using Cmd-Option-Up, which will make it a connected clip and leave a Gap in its place, then make my change to the clip, trim it back to the original length, then push it back down to the primary storyline using Cmd-Option-Down. Not as simple as a single keystroke unfortunately, but the technique does work across multiple scenarios, which is handy. Hi David, yes that is what I meant: to freeze the frame without adding length. Thanks for the workaround, that is one way to do it. It’s no real problem it adding length asa there are ways to change it back to the desired length, but it was more that 99% of the time I don’t want to add length, so I’d prefer that to be the default. Personal preference is all. Thanks for commenting and the suggestion though. I found many of the bugs in Premiere CC have been worked out and I find that the Cinema 4d integration with After Effects to be too good to pass up. I was an FCP7 guy for years but switched and love the Adobe CC. I use Illustrator and Photoshop in mo-graph production as well as After Effects and Premiere. At $49 a month, its a bargain. Good article! Hey Christopher, glad you liked the article and thanks for the comment! Like you say I think it’s about judging your own situation as to which avenue to go down with FCP vs PP. If you use Illustrator. But for our business uses FCPX is really great for us. I’m pretty sure there isn’t a plugin version of Resolve, only the stand-alone application which offers editing and color grading features. Am I wrong? Hi JC, yes you’re completely right – there is just the standalone version. Amended the article to reflect that now! THIS IS FAIR. THIS IS VERY FAIR. At first I thought this was going to be very offensive and Mac bias but I quickly saw that you guys have valid reason for switching. The unresponsiveness and the price. you should clarify in the blog post that some of your cons of Adobe Premiere are localized issues and not bugs for everyone. I concur with Dynamic linking and bad renders being problematic but your other cons are issues that I’ve never encountered. Hey Greg, thanks for the comment. This was very much a subjective review which I think we mentioned in the post a few times. However, if you google each of the cons we’ve listed then we’re definitely not the only people to have encountered them. I know they don’t happen to everyone one – and as we said if we didn’t encounter these bugs then we’d probably have stuck with PP – but we did encounter them – over and over again- and so did many other people. I appreciate what you’re saying that they aren’t bugs for everyone, but they are certainly not bugs just for us so I think they justify being mentioned rather than pretending that they don’t exist at all. I really liked PP but it was just unworkable on a Mac, I know many people who say the same things and have switched from PP for that very reason. Is the background rendering and the control over it, something you find useful in Final Cut X? Thanks for the in-depth article, really informative! Now after using it professionally for several months on paid jobs: what is your verdict? Do you regret switching? Do you still like it? Do you have an updated “pro” and “con” list, because you maybe found new ways of approaching edits? Would be really interested to hear this. I wanted to do a project on FCPX a couple of weeks ago (coming from Premiere), struggled massively with the new editing approach, came back to Premiere and felt really stupid. But I ordered a new iMac and am wondering if it might be worth trying to switch (at least for one project) a second time. Very interesting article , really i learn somthing for from your side so thaks for sharing a very healpful post.